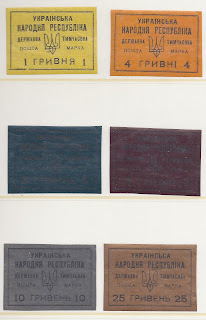 Trevor Pateman's Philately Blog: Ukraine 1920 "Petliura Provisionals"
In a recent issue of Ukrainian Philatelist,( 2012; vol 60 no 1) Mark Stelmacovich gathered together known information and background about the stamps shown above. In fact, very little is known and the stamps are rare which doesn't help. John Bulat lists them in his catalogue at page 140 (#2545 - 2551). I have only come across them on three occasions in 20 years: (1) A small group of singles and tête-bêches in an old collection of Russian or Ukrainian provenance which I bought in an English postal auction. (2) A set in the Zelonka collection. (3) Now this group above which lacks the 2 Hr value. With the other known sets or part sets listed by Stelmacovich we still have only half a dozen sets or part sets recorded. But rather crude forgeries exist. The most obviously notable feature of these stamps is the paper. It is the kind of paper intended for things like chocolate or cigarette boxes or for decoration. It seems unsuitable for stamp production: it would have been very expensive and the dark colours used for the 3 and 5 Hr make the overprint impossible to read - so much so that I have ended up putting the 5 and 3 in the wrong order above. Zemstvos sometimes used papers like this (Nolinsk, Livny for example) and I have also seen similar "chocolate box" papers used for the 1915 Fellinn War Charity vignettes.